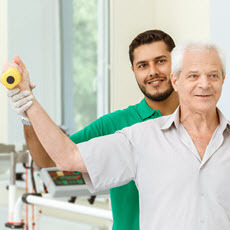 Rehabilitation is care that can help you get back, keep, or improve abilities that you need for daily life. These abilities may be physical, mental, and/or cognitive (thinking and learning). You may have lost them because of a disease or injury, or as a side effect from a medical treatment. Rehabilitation can improve your daily life and functioning. What are the goals of rehabilitation? What happens in a rehabilitation program? Depending on your needs, you may have rehabilitation in the providers' offices, a hospital, or an inpatient rehabilitation center. In some cases, a provider may come to your home. If you get care in your home, you will need to have family members or friends who can come and help with your rehabilitation. Article: The Occupation-Based Intervention of Bathing: Cases in Home Health Care. Article: Occupational Therapy's Unique Contribution to Chronic Pain Management: A Scoping Review.